Devon Allman has been truly blessed and he is completely grateful. 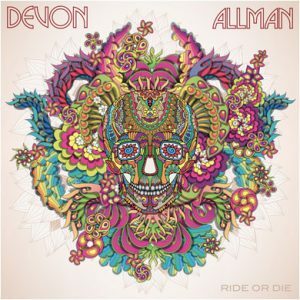 Having left his friends and brothers in Royal Southern Brotherhood, Allman is able to take a wee bit of time for himself, and “paint his own canvas.” His newest album, Ride or Die, drops on September 16th. Out on the Ruf Records label, Ride or Die is a strong album. Allman has raised the bar on himself, giving fans a well-rounded, well crafted, high energy collection of performances that really hit the mark. The album’s 12 tracks held us transfixed for 49 minutes, and in today’s world, where folks have an eight second attention span, that’s saying something! Recorded in Nashville, Tennessee, Ride or Die is produced by Allman and co-produced by Tom Hambridge. Hambridge also mixed, mastered, and played drums on this record. Allman plays guitar, bass on six tracks, and he provides spirited vocals as well. Joining them are Tyler Stokes – guitar, Steve Duerst – bass, Ron Holloway – sax, Bobby Yang – violin, and Kevin Mckendree caresses the keys. Now, folks might be driving their cookie-cutter Ford, Chrysler, GM, Nissan, or Toyota down the road, but the second the first notes of “Say Your Prayers” hit those ears, they are driving a Chevelle SS and they are burying their foot in it. Yes, friends, an album that actually inspires highway running again! “Say Your Prayers” takes us back to the muscle throbbing, heavy-lifting, heart-pumping blues inflected rock of the 70s. Not only do Allman and company rock with a hard groove, but on “Find Ourselves” they give us three plus minutes of brilliant soul that tips a hat to Johnny Rawls while Allman brings it home with a vocal marrying the emotion to the music perfectly. Other performances that captured us include the gloriously textured “Lost” with its acoustic underpinnings, washed over with a voice box generated Wah-Wah sound. “Pleasure and Pain” once again conjures memories of finely constructed 70s soul, with its sea of keyboard and guitar washes that bathe us in their glow. We really enjoyed “Live From the Heart” immensely; it just flows, and exquisitely so. We enthusiastically recommend this fine collection of performances for anyone’s collection. Allman’s vocals are unadorned, truthful, and convincing, delivered with a delightfully slightly salty edge. The textures that these musicians create are genuine, deep, and moving. Ride or Die is an album that listeners will find themselves playing over and over. Pick it up soon.